Deep thinkers at CIBC perceive a need for an economical ice sailing craft for softwater sailors idled by winters icy grip. The world’s most popular iceboat, the DN, an excellent sailer, is in the four figures well used and several four figures new. Our “Cheapskate” design can be built for $200-300 and sails very well with Sunfish spars and sail. The Sunfish is the world’s most popular personal watersailer due to good sailing properties of its unconventional lateen rig. Old Sunfish spars and sails are easy to find. Our Cheapskate is a hybrid of the proven footprint/wheelbase and major component relationships of the DN with the kindly sailing characteristics of the Sunfish rig. The economy of Cheapskate is achieved by avoiding the refined go fast aspects of the DN that have evolved over seventy years of racing a boat that was originally designed to be economical and easy to build, our goal also. We have come full circle. Cheapskate is made of lumberyard/hardware store materials with a little help from the local dump and scrap piles. Cheapskate sails very well. Some building skill, with special attention to a few details, is required. We immodestly suggest reading Think Ice by Lloyd Roberts available from Chickawaukee Iceboaters www.iceboat.me or International DN Ice Yacht Racing Association IDNIYRA. The plans are a combination of drawings with dimensions taken off our prototype, photographs which we hope will reduce head scratching, and timeless prose which may cause head scratching. The Cheapskate is shorter than the DN by 20 inches and wider by 1 inch. The other dimensions and locations of critical components all fall within allowable dimensions of the DN class specifications. Changes in locations of specified components may very well make changes, and not good ones, in performance. 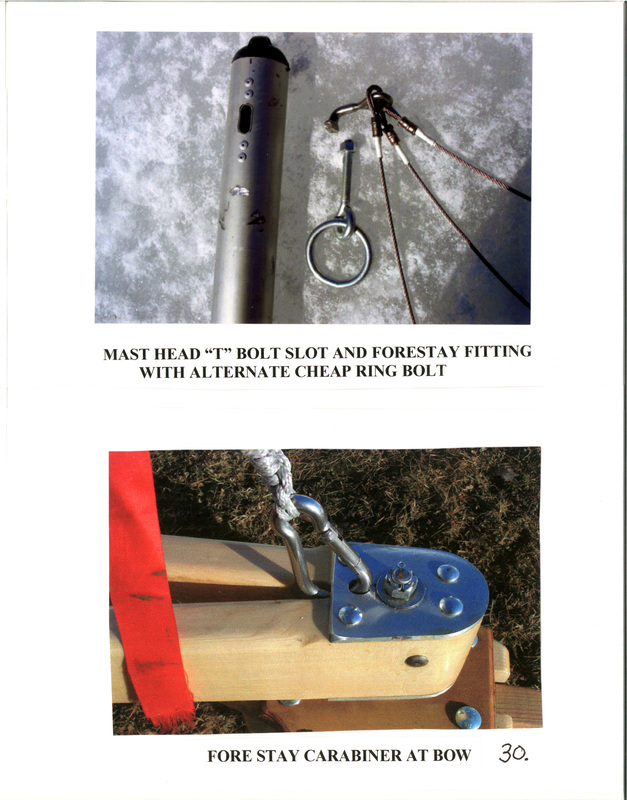 The Sunfish rig components, mast, spars, and sail, are all factory Sunfish with bow and side stays added. Don’t “improve” what already works very well. 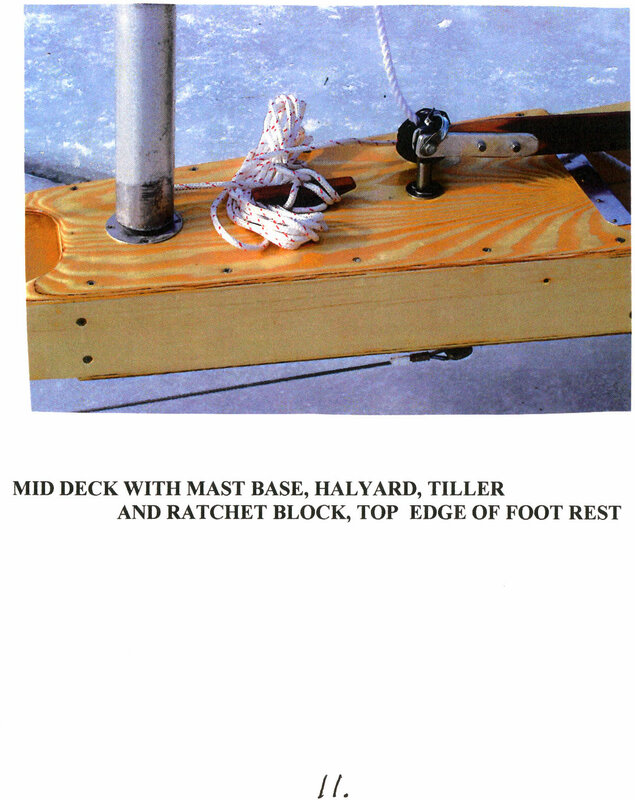 It is better than any other small iceboat we have seen built from Internet designs. 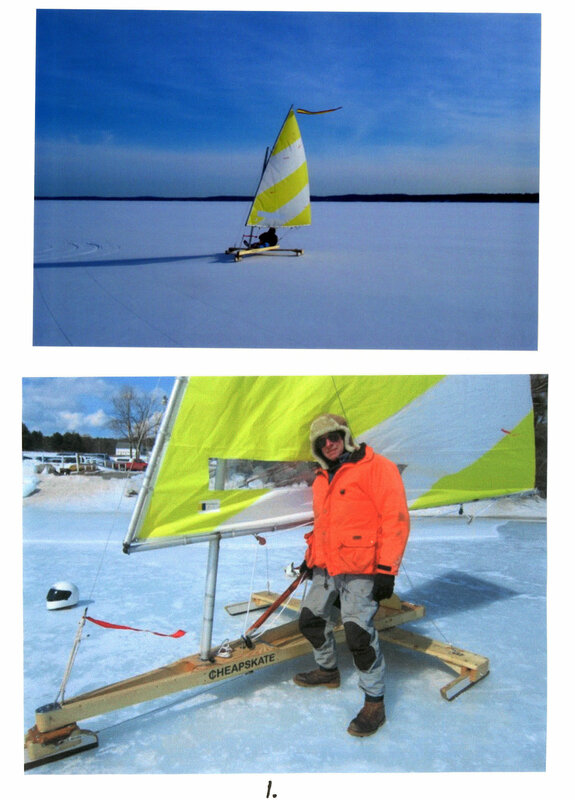 Lloyd Roberts has been iceboating for some forty years. He is the co-author of Think Ice The DN Iceboating Book, now in its sixth printing. He also is the designer of “Gambit” a successful cartop two seat iceboat since the 1970s. Lloyd has long since given up racing and sails entirely for fun. Testing and developing the Cheapskate has been great fun. Bill Bunting, Maine and maritime historical author, is the head instigator of the Cheapskate project and provided the name. His wife Jennifer is a retired publisher, she polished the text. Bill Buchholz is a professional boatbuilder, repairer, restorer, and avid ice sailor with a track record of building lovely iceboats from scratch or pieces of derelicts. Bill built the basic structure of Cheapskate from an old design with a few nice touches to give some elegance to the originally rather Spartan craft. He builds fast and well. Al Heath, club member, is the owner of our vintage prototype iceboat built by Al Bryan and Cortland Henniger (“ALCORT” founders) in the 50s which was the progenitor of the Sunfish. We are not breaking new ground. John Stanton, our long suffering web master, has constructed our fine and popular website “iceboat.me”. He has dispelled some of our ignorance. Stacey Warner of Warner Graphics has printed our Newsletters for years tolerating our scissor and glue stick cut and paste technology. We are very grateful for her patience. Dennis, the shop cat, still welcomes us. Lloyd has corralled innocent iceboaters, non-iceboaters, and even non sailors to sail the prototype and contribute to its refinement. They all seem to love it, many of them want one, we are encouraged. We hope their enthusiasm is shared by future builders of Cheapskates. Nothing here needs to be bent, laminated, or tortured. Straight pieces of spruce or fir are recommended, NOT pine or cedar. The wood does not need to be completely clear of knots, small “pin knots” are OK but not loose knots or wavy grain. This is a highly stressed structure, especially forward where visible flexing occurs while sailing (smoothing out the ride). Stress continues back to the runner plank attachment. Put the knots aft around the lunchbox. 2 X 4s are big enough. The cockpit looks very shallow but no one has fallen out while sailing. 2 X 6s would add a lot of weight and likely produce a rougher ride, like a DN with its rigid box structure. Do not box in the Cheapskate forward. 1 X 6s might split from torsion stress. Split DN sides are not unusual. Stay with what works. 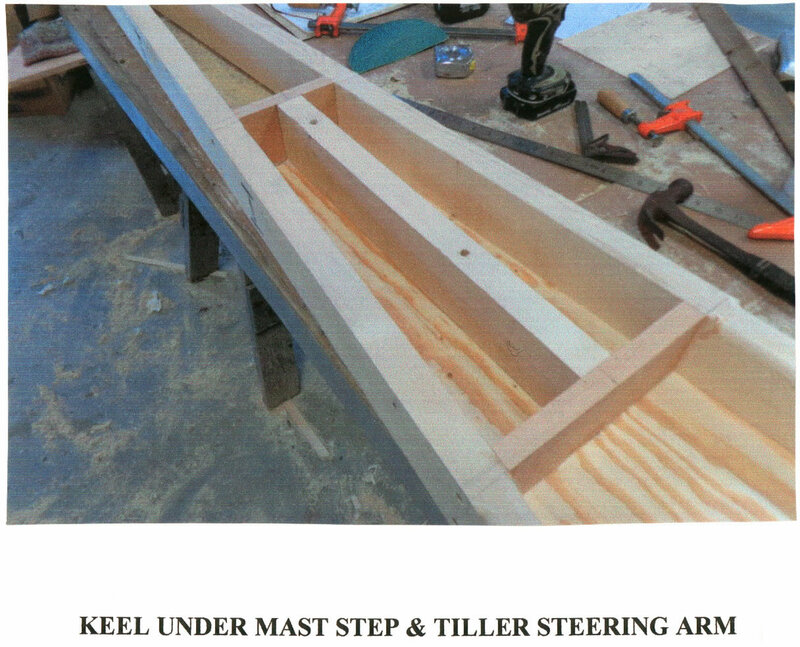 Note that there is a central 2 X 4 keel enclosed within the maststep/steering post box. This keeps the mast from punching down through the deck and floor due to lots of downward stress here. Some thought is needed if the builder wishes a longer or shorter cockpit. The plank is already as far forward as allowed in the DN and the wheelbase already short, which affects steering, already brisk. If the seat back is forward of the rear of the plank it is difficult to get into the boat. The seat back/plank relationship should be retained. Therefore to shorten the cockpit you can either move the forward cockpit bulkhead back or put a crosspiece on the floor to rest you heels on. If the bulkhead is moved back there may be interference between your feet, which are close together, and the tiller. The tiller steering column can be moved back, leaving the mast step where it is please. To lengthen the cockpit the seat back AND plank can be moved aft which may improve high speed handling and reduce the briskness of the steering. Moving the seat back aft but leaving the plank forward will take weight off the steering runner which already has just enough weight for reliable steering. Moving the forward bulkhead forward will compromise foot room, already narrow. Choose these things carefully as they are hard to change later, (guess how we know). We glued most joints with Titebond III which is waterproof and economical. Screws and bolts are used to hold things together while glue sets. Highly stressed joints of runner chocks are reinforced with 3/8 carriage bolts. Do not use el cheapo Home Depot bolts that are threaded all the way from nut to head. Buy good bolts, “zinc plated” are fine, with solid unthreaded shanks to resist bending. The 3/8 plywood forward deck, floor, and seatback we made from 3/8 yellow pine floor underlayment stock, not too heavy, (but maybe not waterproof, varnish/paint liberally). Fir plywood will not finish well, is heavy, and will weather badly, cracking paint and varnish. 1/8 plywood probably isn’t strong enough, 1/4 might be. Seatbacks get fallen on and break, cockpit floors get punctured by boot spikes and delaminate from water. Put drain holes in the cockpit and lunch box corners. The 1/8 aluminum sheet used for plank attachment plates and mast step base should be “T-6” hardened stock. Likewise the 3/16 bow reinforcement plates. This stuff still cuts nicely with power saws and can be drilled and tapped for bolts (bow plate ?). 3/16 could be used for all the above for simplicity. Try a welding fabricator for this and steel stock. The seemingly small #8 wood screws holding the 1/8 aluminum plank attach plates look flimsy. They are intended to tear out of the 2 X 4 sides if the plank hits something so the plank might not break or the side of the fuselage get torn off. Then you just move the plank a bit and refasten both sides. They may loosen over time just from rough sailing. Leaving the plank attach bolts one turn loose will keep the flexing plank from prying off the plates and loosening screws.We have not yet found a good source, other than our junk stash, for the 1/4 nylon/Delrin plate or washers for the steering bracket and front runner steering assembly. Tough, about 3/8 inch thick, plastic kitchen cutting boards may be OK. The mast step is critical. Downward pressure of the mast is hundreds of pounds. Our first mast step plate was 1/16 aluminum. It soon became dished like an ashtray. 1/8 hard aluminum has held up well. The central 1/2 inch diameter pin that locates the mast was originally 2 inches high. When the mast fell over (side stay coming loose), this long pin pried the hard plastic bottom bearing in the mast out of the mast, not good. The answer is shortening the step pin to only 5/8 inch. Now the mast can be tipped right off or onto the pin with no problem. This makes setting up and dismantling the rig easier. The mast does not seem to bounce up and down under way even on very rough ice, so the 5/8 height is just fine. The 1/2 X 5 inch lag bolt, is screwed into the central keel, maybe with some glue for waterproofing, until only the smooth shank is exposed, and then cut off with a hacksaw and the edges rounded pleasingly. 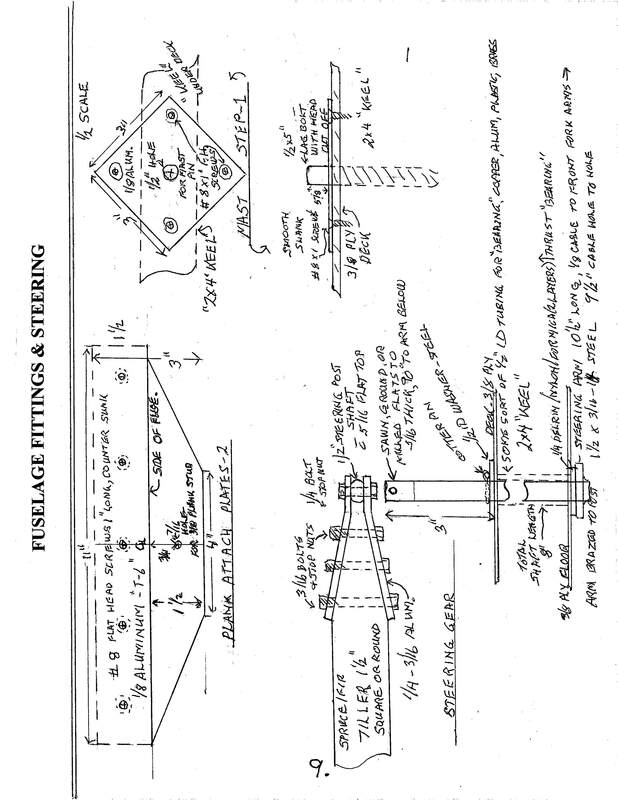 The steering gear is on two sheets, “Fuselage Fittings and Steering” and “Front Fork and Chock”. Steering starts in your brain and runs through the tiller to the steering shaft, to the steering arm, to cables to the front fork steering arm that is built into the front chock that holds the steering runner. All of this functions as a unit, smoothly and without noticeable slop, so that the boat goes where you want it to go without requiring thought as to what you have to do to get it there. This is not trivial. It is like steering your car holding onto the bottom of the wheel or steering a sailboat with a tiller Cheapskate is simple and easy. With the double cable steering, both sides of both arms must be of the same length so the cables and arms form a parallelogram, otherwise the steering will bind. The cables do not have to be humming tight, just not drooping loose. Only one of them is working at a time anyway. It is absolutely vital that the steering gear does not come apart by a cable coming loose or steering arm breaking. When you lose your steering the outcome is often bad, sometimes disastrous. If turnbuckles are used in the cables, make absolutely sure they are secured with safety wire. Lock nuts can come loose. Be sure there is adequate thread engagement at both ends. Closed barrel turnbuckles are a source of anxiety because you cannot see how much of the ends are screwed into the barrel. If you use loops of line between an eye in the cable and a shackle in the ends of forward steering arms, check the line for fraying. Some sort of hightensile non stretching line is recommended. The steering arms used here are oversize 1 1/2 X 1/4 inch cold rolled steel. We thought 3/16 would be thick enough but could only get 1/4inch. Resist the urge to use bed frame angle here, it could be brittle, (see “Runner” chapter). No worry about this 1/4inch cold rolled steel breaking or bending. The thickness also makes for a good, solid braze joint to the ½ inch steering posts fore and aft. The rear arm and shaft is pretty simple. It does need a bearing of some kind as noted in the plans so it doesn’t loosen over time and so it won’t bind if water seeps in and swells the wood of the central keel. Ditto the bow arrangement. The bow bearing and steering shaft get some punishment from side loads on the runner underneath, which get converted to torsional loads at the bearing. The bow of the boat is flexible and will absorb these loads. The plywood top of the front chock bears directly against the underside of the heavy aluminum bow plate with a bearing of a disk of formica, nylon, or Delrin. The top and bottom bow plates keep the bow from splitting from torsion loads. The nut at the top of the steering shaft prevents vertical play of the shaft (which is why we have no vertical spring) so that this large flat bearing can help resist sideways torsional loads. Reducing the vertical excursion of the shaft eliminates most sliding friction and consequent wear in the steering bearing. (Old DN’s with front springs on the shaft developed serious wear of the shaft from the top and bottom steel bow plates, which were the only bearings in the system). Oil Cheapskate’s joints. 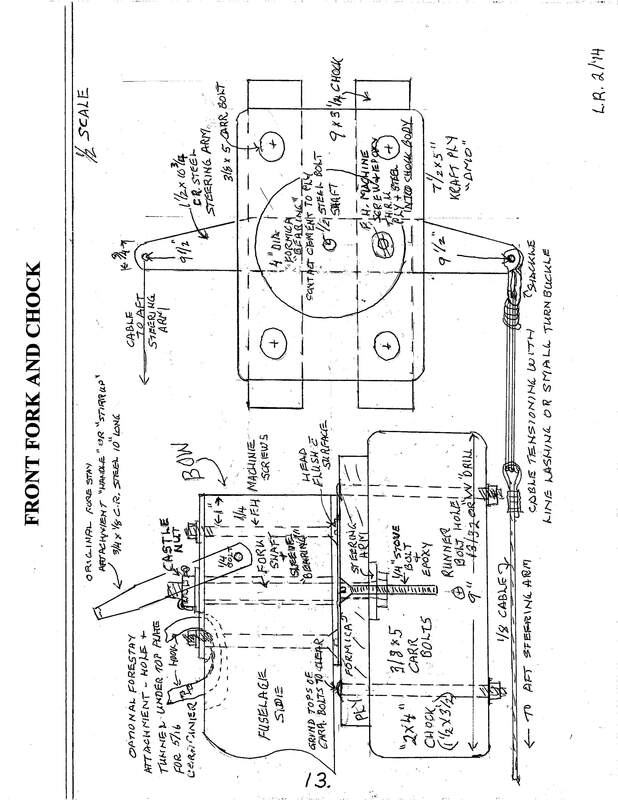 In the plans we illustrate a heavy flat head screw down through the plywood top, through the steel arm, and on into the chock body to back up the fitting of the arm into the top of the chocks. Modern wood screws will not work well as their smooth shanks are smaller than the threads. The easy fix is to bed the whole screw and steering arm in epoxy. With epoxy we can also skip the wood screw business altogether and use a flat head machine screw or “stove bolt” epoxied all the way and bonding to the wood and filling whatever voids were left in fitting the arm to the chocks as well as strengthening the wood itself. Probably the Titebond III would do as well, but Titebond gets sticky quickly, perhaps while the screw is being driven. Epoxy is slippery until it cures. The runner plank is 8 feet long, just as with the DN. However it is 11 inches wide at the center and 9 inches wide at the tips, much larger than on the DN, which is only 8 inches wide all the way. DN planks tend to break right at the fuselage edge, and in the case of all spruce planks this is due to compression failure of the wood fibers. Modern DN planks often have an ash top half and lower half of spruce or more complex hollow arrangements, sometimes all ash. Modern speed tuning leans toward stiff planks and very flexible masts. Older DNs typically had stiff, solid wood, then hollow aluminum masts, still quite stiff, and often the bendier planks were faster and fastest just before they failed. Planks were tuned/shaved to suit the weight of the skipper. Cheapskate’s ancestor boat has often been sailed with two adults or father and two children, something no racing DN skipper would dream of doing to his precious tuned plank. Our plank seems quite stout and just bends to flat, ideal, with 150-200lb skipper. It was intended this way. More bend is tolerable until the rear drags on the ice (rough ride). 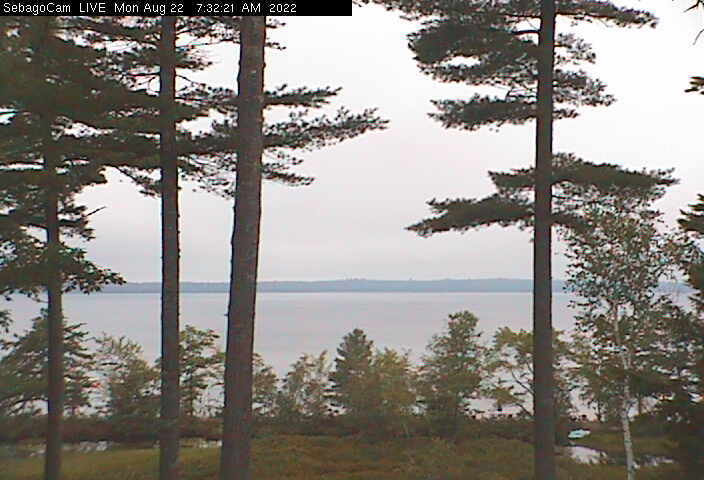 Too much crown, higher than level, is very slow sailing, something to do with runner edge/ice geometry. Our builder, Buchholz, just happened to have a chunk of pretty clear spruce 2 X 12 with a natural bend without twist that looked good to him so he sliced it into a plank which so far works well. Check your lumber yard for a bent 2 X 12 plank. The rest of us will have to make a curved plank or leave the plank flat. We have not tried the flat plank ourselves. The original antique prototype has been sailed hard for years with a flat plank, but we are used to iceboats having a slight upward crown in the plank. They do look better that way. DNs all have crowned planks. Buchholz the boatbuilder muttered something about steaming a board and bending it, often done for wooden boats. The rest of us might find it easier to glue together two 3/4 inch boards to get the 1 1/2inch plank, gluing in a bend of perhaps 1 1/2 inch crown while the glue sets. Wood? Over the years I have had good luck with lumber yard spruce, selected, for the bottom board, I prefer fir for the top. Fir is a bit harder than spruce and doesn’t fail in compression so easily. The chocks themselves are 9 inch long pieces of the same 2 X 4 used in the fuselage. I think Buchholz ran them through the joiner to get at least one edge straight and square. The triangular chock brace is the same stock, same length, square end please. The runner bodies are the same stock, again squared on one edge and planed flat sided for Formica facings to resist abrasion and strengthen the runner body. Note that the finished width, with Formica contact cemented to both sides, is just 1 ½ inch. The runner bolt holes through the chocks and runner body is for a 3/8 bolt, but the hole should be drilled with a 13/32 or “W” size drill. Drill the hole with a sharp drill run fast, in a drill press preferably, to get a clean hole slightly oversize. Then varnish the inside of the holes, clean out any wood fibers with the sharp drill and varnish again for a waterproof hole. This is so that even if the wood gets wet, you can get the bolts out easily at the end of the day when you are tired, it has started to snow, and you are tempted to leave the runners on over night anyway. If you leave them on, grease them. Rusty runners don’t work. 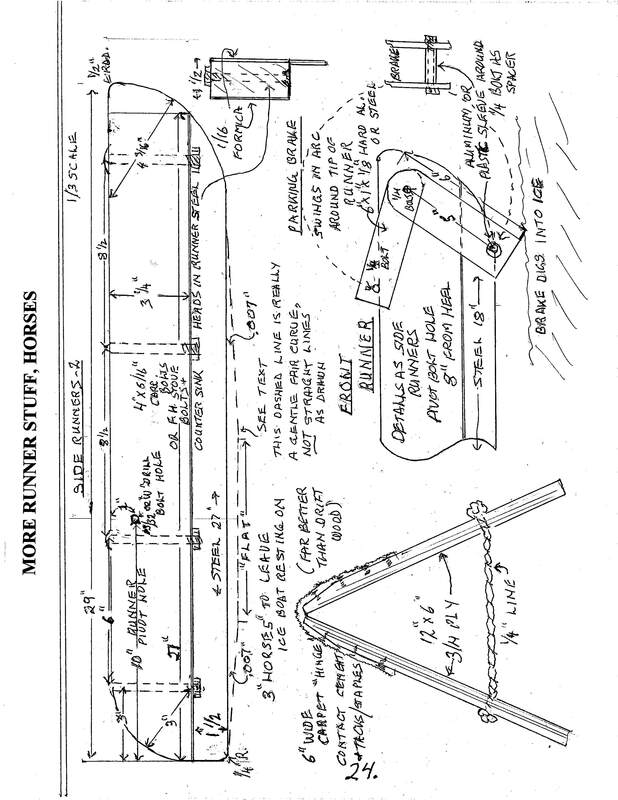 Runner construction will be on another plan sheet “More Runner Stuff, Horses”. Now, before you get carried away, don’t glue the chocks onto the plank while burning the midnight oil. Some care and scheming are required. The iceboat only works if the runners are precisely aligned so that the cutting edges are parallel. 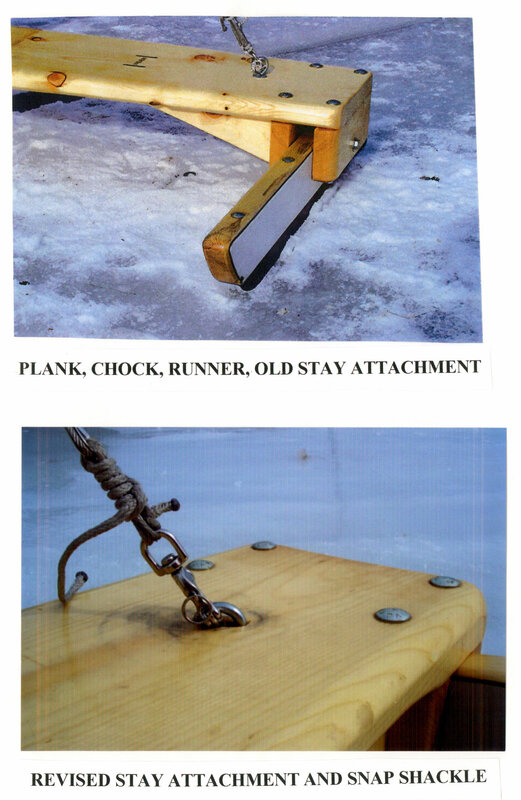 The iceboat is a deceptively simple looking device, however there is one aspect of construction that has to be done right, how and where the runner meets the ice. You cannot dodge this bullet, you have to bite it. The iceboat, regardless of size, elegance, or cost will not deliver the magical ride that makes iceboating so special UNLESS YOU HAVE PROPERLY ALIGNED CHOCKS AND RUNNERS. If you don’t glue the runner chocks to the plank they will move around and the runners will lose their parallel alignment, guaranteed. The 3/8 bolts alone are not enough. Then your nice little ice yacht won’t sail worth a damn. The chocks must be glued onto the plank while clamped onto the runner itself, and the runners must have been properly sharpened so that the EDGES can be set up parallel to each other. WE HAVE TO FINISH THE RUNNERS FIRST. Build your runners as drawn in “More Runner Stuff, Horses”. Squint carefully at the drawing, see the lower edge or bottom of the runner steel. It looks flat doesn’t it? It is not flat. The “profile” of the runner edge is the perimeter of a very large circle, too big to comprehend. It describes a fair curve which is more or less centered on the bolt hole for attaching the runner to the chocks and in fact the “curve” under the bolt hole may be more flat than curve and is referred to as a “flat”. Some experts think it really is flat. Confusing isn’t it? Hold on tight now. The profile of the runner is measured by placing the runner, sharp side down, on a flat surface, such as the steel table of a table saw or the surface of a good quality carpenter’s level. Have a light source in back of the runner. Look for a sliver of light under the edge of the runner. Oh, we didn’t put the 90 degree “V” shaped edge on the runner yet. That comes first. How? The best runner sharpening rig is a long table belt sander with the table set at 45 degrees to the sanding belt. 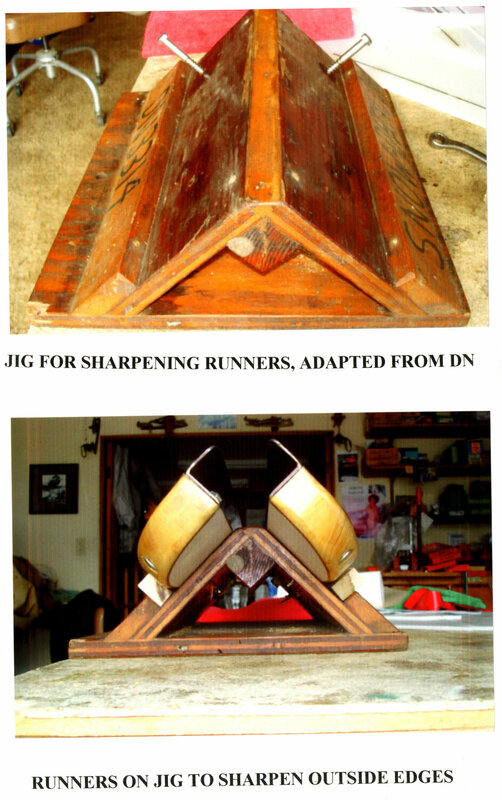 The next best is a jig built to hold two runners at 90 degrees (see photo) and sharpen two edges at once with a hand belt sander, what we did for years. The worst is a hand held belt sander or grinder with no jig. Sandpaper glued to a sheet of plywood is OK for resharpening, but we have to remove quite a bit of steel from our perhaps quite hard bed rails to get the 90 degree edge, let alone a nice fair profile. This is the most difficult part of building and maintaining your iceboat and it takes quite while to get it right, maybe hours. The profile should be checked with each sharpening, as most of the wear is beneath the pivot bolt where the iceboat weight is. If only the visibly dull (you can see the edge) area is sharpened you can easily create a “hollow” profile that will be slow. However this profile does not have to be exactly as described to work reasonably well. What we are looking for is a gently curving runner edge more or less centered on the pivot hole, as that is where most of the downward pressure of the iceboat is on the ice. You can see the fairness of this curve or “profile” on the flat surface rocking the runner back and forth and indeed, with practice, just sighting down the sharpened blade from either end. Last but not least while sighting down the sharpened blade or down at it consider the straightness of the sharp edge and how well it is centered in the 1/8 wide blade. This edge may be better seen by pointing the runner at the edge of a window so that one side looks bright and the other side of the edge looks dark. If the edge is wavy selectively sharpen it until the edge is straight. The runner really needs a straight cutting edge. Perseverance is needed. An inexpensive laser with a couple of notches filed in it to slide on the sharp edge can be arranged to project the laser dot onto a wall. If you can then slide the laser back and forth without the dot moving sideways on the wall the runner edge is reasonably straight. Similarly a low power rifle scope, with mounting blocks, can be grooved to accomplish the same thing when aimed at a vertical line on the wall (the further away the better). All of the above is much easier to see than describe, especially once you have seen it. Rubbing shoulders with an experienced ice boater at this juncture will be very helpful now and mandatory later. We never sail alone. Now that you have runners and chock sides finished, pivot holes drilled in runners and chocks, 3/8 chock bolt holes drilled in the chocks (using a drill press we hope) but not in the plank, you are finally ready to mount the chocks with proper parallel runner alignment. The plank ends must be really and truly square with the plank centerline. (A radial arm saw would be nice here). Fasten the plank upside down. Using the runner bolts, clamp the chock sides to the runners, including a piece of manila file folder shim (.010 inch, ten thousandths of an inch) so that after the glue sets the runners will be almost a slip fit in the chocks. In use the runner bolts will be tightened until there is no clearance between chock and runners, just a nice, waxed, slip fit. Now you can clamp one pair of chocks to the bottom (now top) of the upside down plank with the outer chock face flush with the plank end. Drill through the chocks and plank, apply glue to chocks and plank, reassemble, clamp, fit bolts through plank and chocks and tighten the nuts. Let the glue cure. Now that first pair of chocks cannot move. We can align the second runner with its own chocks, drill holes through the plank, apply glue, reclamp, check final alignment, tighten bolts, recheck alignment, adjust as necessary, retighten again, check again, and only then leave overnight. How parallel do they have to be? As good as you can get, plus or minus 0.001” (one thousandth of an inch!) over a foot or so of runner edge is possible and realistic. This is the most important step in making the whole iceboat. How do we do that alignment? Get help, you need two people, one unskilled is OK. The best, easiest , and fastest way is with a dial indicator (cheapo Chinese about $20) on the end of a stick with a fixed soft aluminum spud at one end struck on the runner edge with a hammer to notch it so it will ride on the sharpened edge of the glued runner. At the other end is a moveable similarly notched spud riding on a smooth rod, fixed into the end of the stick. This spud needs to have maybe 1/2inch travel. The dial indicator, fixed to the stick, measures the movement of the moveable spud. The spuds on both runners can slide back and forth 6-8 inches on the fixed, glued runner and on the still loose runner in its unglued chock so that misalignment can be measured with the dial indicator. Carefully level both runner edges and plank. Then the whole dial indicator arrangement is slid back and forth along the runners by the assistant and measurer simultaneously. See Think Ice for a nice photo and description. Minor adjustments to the clamped chocks are made until the runner edges are parallel. Then the 3/8 holes are drilled through the plank, chocks removed, glue applied, and chocks clamped back on to dry. Before leaving the field of endeavor check with the dial indicator again. Things will have moved slightly in the glueing and bolting so try adjusting with light tapping or maybe tweaking the bolts’ tightness before the glue sets up. Get it right. Then don’t go anywhere near it at all until the next day. Leave the tools, don’t clean up, leave the heat up, turn the lights off slowly, and tip toe away. The hard stuff is done. You deserve rest and relaxation. Alignment can also be done sighting with the rifle scope at vertical parallel lines (the further away the better) exactly the same distance apart as your runner edges at the pivot bolt. Probably a laser dot will get too big at any meaningful distance (20-30 feet) to be accurate. After the glue dries the triangular brace pieces may be fitted, screwed, and glued. When all is done the chocks will not move short of major impact which should be apparent from fractured wood or glue lines. Do it right once and forget about it. We have sailed Cheapskate hard on some very rough ice with no problems. The 1/4inch eyebolts near the end of the plank are for the sidestays. At first we just bolted the eyebolts, with a washer, flush with the top of the plank and lashed the sidestays to the eye of the bolt. This had to done for each set up to go sailing and turned out to be a cold fingered, time consuming aggravation, intolerable. Then we went to shackles, not very expensive, but the possibility of a shackle pin unscrewing or losing it in snow was unsettling. Then we tried “Carabiner” style mountain-climbing snap hooks, quick and easy. However these somehow wound around the eyebolt eye to undo themselves while sailing, annoying. Finally one of them managed to bend the spring-loaded snap lever so it could be neither opened or shut. Sidestay Carabiners were retired. (The forestay Carabiner is restrained by the top plate it goes through and the underlying wood frame so it does not flop around, it works just fine). One of our yachting friends suggested “snap shackles” (not so cheap) as being well behaved and non self opening. These too managed to undo themselves once in a while. The apparent cure for all this nonsense is to gouge some wood out of the plank and half bury the eye of the eyebolt into the wood. Now there is not much of the eye above the surface of the plank for the shackle to interact with. Finally, we have not had the snap shackles misbehave in many hours of sailing. They work easily and quickly as hoped. This has been the only real problem we have had in prototype testing. We had a similar problem with a Carabiner attaching the added sheet pulley to the screw eye on the stern. This was resolved by running the Carabiner on a rope traveler, see Sailing. 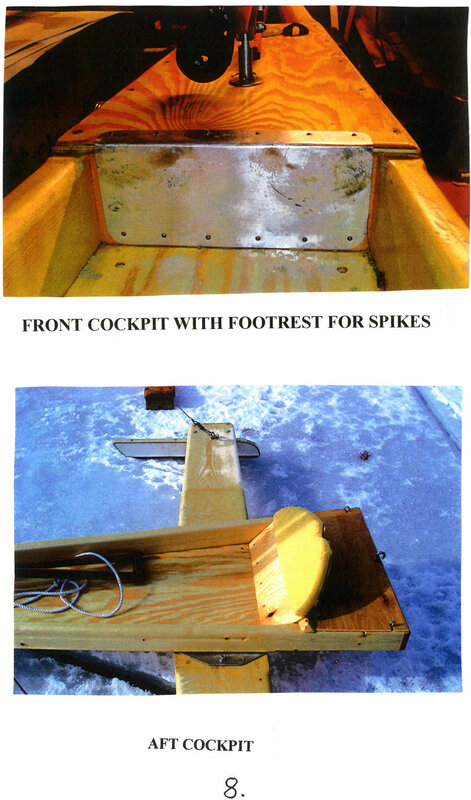 Iceboats work because of almost zero sliding friction. Good runners, properly sharpened, carefully maintained (no rust please), and precisely aligned parallel are vital or the whole exercise will be disappointing. We have been lucky to come up with easy to build runners that work well. 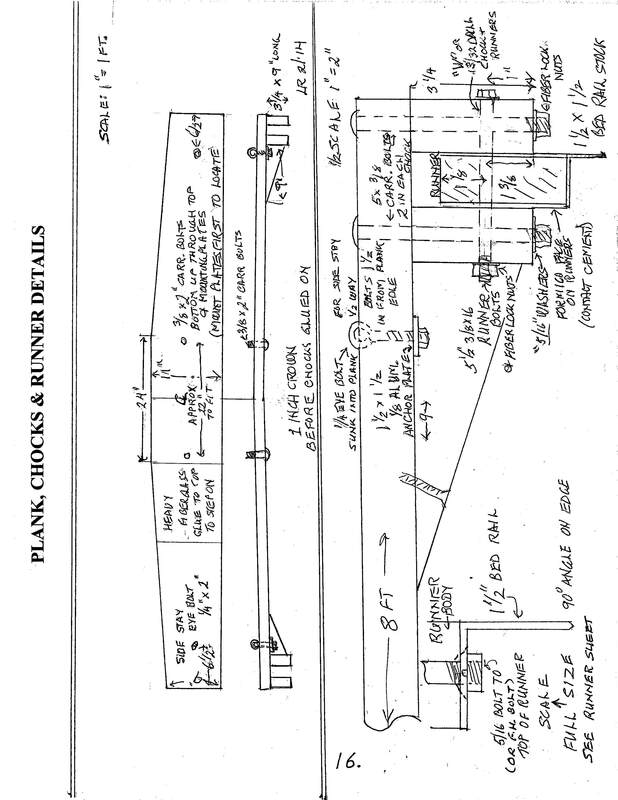 In the early phase of engineering “Cheapskate” Buchholz suggested we think about angle iron runners, long used with the angle at 45 degrees and sharpened, the flats of the runner steel screwed to the wood of the runner body. Such runners are still used for sailing in melting ice as “slush runners”. Slush runners are fun but rarely used. What Buchholz had in mind however was using the angle iron with one leg straight down and the other flat against the bottom of the 2 X 4 runner, in keeping with our 2 X 4 simple construction. Furthermore he just happened to have a steel mattress bed frame rail that was (and they still seem to be) 1 ½ in. wide sides, 1/8 inch thick. The 1/8 seemed a bit wimpy, DN runners are 3/16 to ¼ thick. But, an angle in the hand is worth two in the store and the price was right. He got two 27inch side runner pieces and one 18 inch steering runner from one piece of bed frame rail. Standard DN steel plate runners are 26 inches. Steering runners are sometimes shorter even than our 18 incher. We were solidly in the DN design ballpark and it turned out he had hit a home run. The spruce runner bodies are planed to less than 1 ½ inches to allow for the Formica contact cemented to the sides of the bodies to provide a hard bearing surface in the wood chocks. The chocks were not varnished on the inside. The Formica is liberally waxed with “bowling alley” carnuba wax or cheap Gulf block paraffin wax used for sealing jelly jars. This has worked well so far without visible wear to either Formica or spruce chock walls. 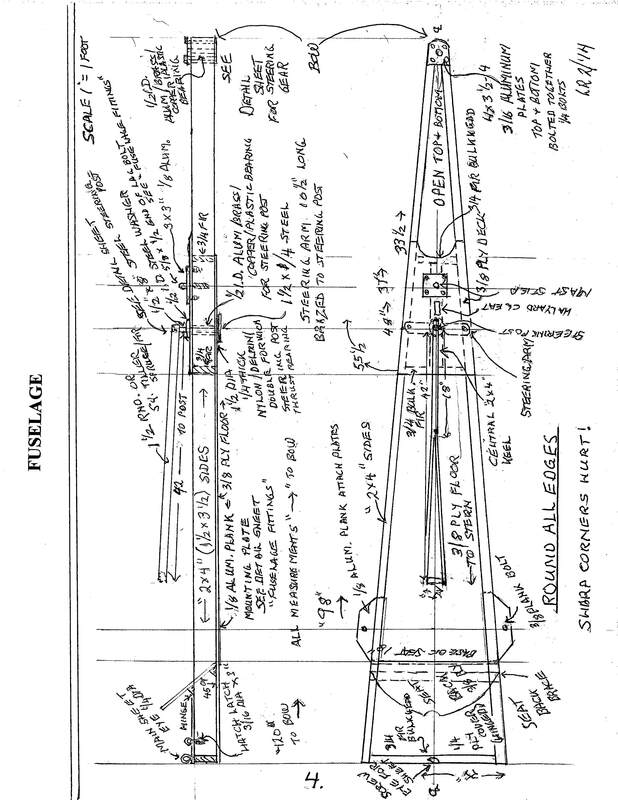 He fastened the steel angle to the 2 X 4 spruce runner bodies with 5/16 carriage bolts from top to bottom through the horizontal leg of the angle iron, four for each runner. I chided him a bit for having the bolts and lock washers hanging down to possibly catch on bumps or drag in very soft ice and I wondered about putting flat head “stove bolts” up from the bottom for a smooth under surface. The answer was “Go ahead if YOU want to, but the steel wasn’t really straight and had to be tweaked for each bolt.” I had a vision of pulling the carriage bolts out and the runner blade going all wiggly on me. I didn’t want to. Besides the bed frame stock turns out to have a reputation for being hard to saw, drill, tap, etc. Vide infra. Buchholz fitted the angle steel and roughly shaped the runners with a hand grinder and cut off wheel wondering how they were to be sharpened with the vertical blade offset to the edge of the runner body. That was my problem. We have at his shop, “iceboat central,” a Grizzly long bed sander for sharpening runners. The sanding belt is set at 45 degrees to the bed of the sander, a standard runner sharpening arrangement. We had been scratching our heads over possible jigs for holding the runners on the sander because of the off center runner edge. It turns out that nothing is needed, just slide the runner body on the table as usual. On the outside edge the sander sharpens as usual. On the inside edge the sander sharpens both the runner edge and the outer edge of the angle steel that is bolted to the flat under surface of the runner body. Oh, pleasant surprise, we have a built in 45 degree arrangement for one edge! Our home made sharpening jig is only needed for the outside edges. 2 1/2 hours later we had 3 sharp profiled runners. We start with a 40 grit belt for the shaping and profiling. Lots of sparks from the sander suggest a high carbon steel. We then go to 80 grit and 120 grit to finish, perhaps followed with 220 grit for polish and show. We have sailed them at dozen times now and they are still sharp enough, good steel indeed. Usually with Sarns hardened steel plate runners or custom made inserts a good sharpening to invisible edge at the start of the season for the glass hard cold new ice lasts through the season, gradually dulling somewhat which is OK as the ice tends to soften as the winter progresses. Our mattress frame angle is indeed pretty good stuff, a nice surprise. So what is mattress frame angle? Is there an industry standard grade you might order off the shelf? Buchholz rooted around on the internet finding a website/chat room called “practicalmachinist.com” and found interesting opinions about what these machinists call “mystery metal.” It is surmised that the stuff is melted-down scrap, anything from ships to railroad tracks. At best it is likely tuned in the melt by burning off excess carbon or adding trace compounds to get something strong enough at the thin 1/8inch gauge used for mattress support to withstand wrestling 300 pounders. At worst maybe the chopped up tankers and battleships are just melted down and stirred by coolies fresh out of the rice paddies, rolled to angle stock, and sold around the world of global commerce. The machinists suggested that older steel from the U. S. industrial golden years might be better than current Asian production. Choose your junk carefully. When scrounging for steel you might take a hacksaw to make sure you can cut what you find and that it isn’t really soft. At any rate they report hard spots, spontaneous brittle problems, dulling of tools, difficulty welding, etc. The “practical machinists” recommend using bed rails as fence posts rather than aircraft spars. Perhaps we lucked out. Time will tell, your feedback will be appreciated. 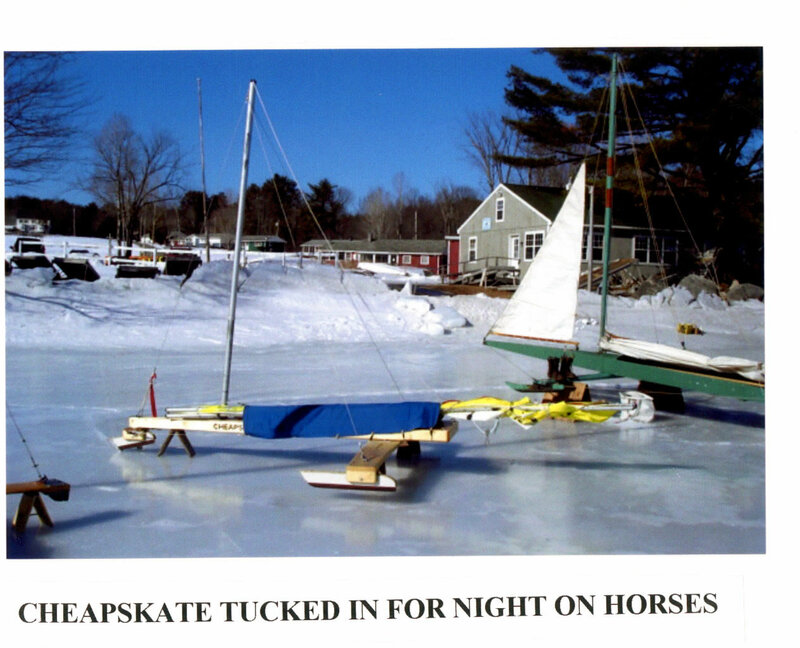 Little horses to hold your ice boat off the ice overnight or over winter are easy to make and last for years. The carpet hinges are freebe unused scraps from flooring shops. 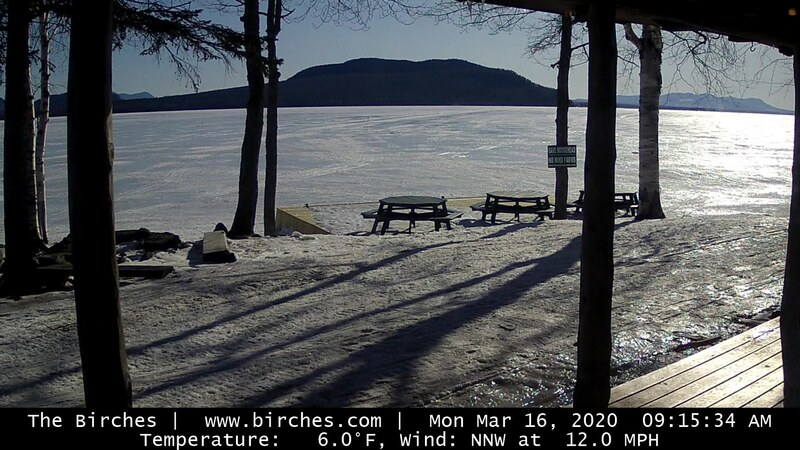 It is really tacky to see a nice ice boat resting on bits of rotten trees or scraps of wood, let alone old lobster traps that someone left for the summer at our beach. The last trinket is a mountain climber’s ice anchor to screw into the ice and keep your rather light weight yacht from blowing away overnight in heavy-air storms. (See Think Ice). You won’t find these at the dump, not cheap but worth their weight in titanium which they often are. The front runner parking brake is NOT AN AFTERTHOUGHT, it is an absolute necessity. When you get out of the boat you absolutely must set the front runner brake and release the sheet, unsnapping it from the traveler so your yacht doesn’t sail off by itself as an unguided missile to injure somebody or some other boat or head by itself for open water. If you lose the brake, or if it is very windy, tip the boat over. It won’t go anywhere. The brake should be a tight friction fit on the runner so the boat won’t blow off the brake backwards. It also serves as a towing hitch for dragging a damaged or becalmed boat home, as it will steer the boat as you pull, and tow easily. The sail and spars of the Sunfish are used as issued with one exception. The mast on the Sunfish has no stays, it sits down in a hole from deck to keel, maybe a foot deep. The Cheapskate fuselage is only 3 ½ inches deep and the floor only 3/8 plywood, not enough support for the mast with large tipping forces and considerable down thrust. So we have a deck top mast plate and locating pin, all backed up by the 2X4 central keel under the deck. The mast needs a forestay and sidestays to stay up. We went fancy and used a “T Ball” ring fitting that goes into a slot we cut near the top of the mast, ask a sail maker/rigger about these. They come in varying sizes/strength. I think we used 1,000 Lb test. We could have simply used a ring bolt, 5/16 would likely suffice. The stays are “Nico pressed” around the ring and run down to near the bow and plank attachments and have a thimble “Nicopressed” into the end for lashing with line or whatever other attachment scheme suits your fancy. We set up the shrouds so that the mast is leaning backward slightly, maybe 1-2 degrees. It looks better that way. Leaning forward looks awful. We use a ratchet block for the sheet (often found on the front edge of the Sunfish cockpit) on the top of the steering post for the sheet. 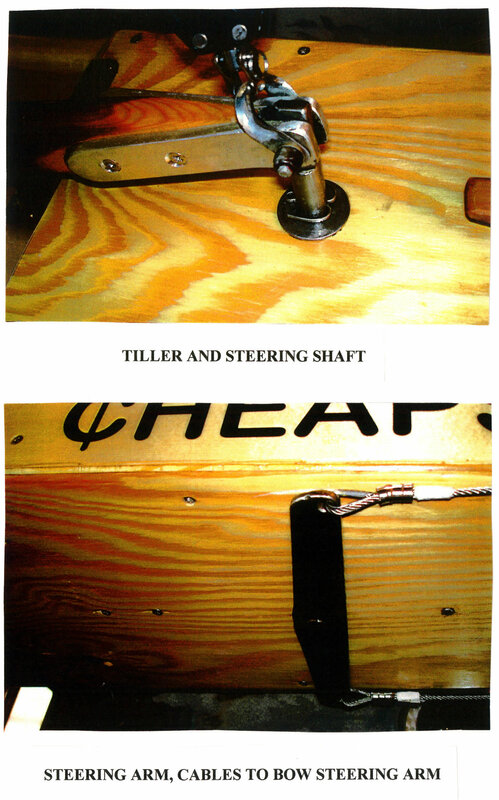 Sailing “Cheapskate” you don’t absolutely need a ratchet block but your carpal tunnels will appreciate one. The Sunfish sheet is rigged along the bottom of the boom and down to a traveler on the rear deck. We found the sheet pressures kind of high at iceboat speeds (more wind on the sail) so we added a sliding block into the sheet riding along the Sunfish-like traveler and then back up to the boom giving us 3:1 advantage instead of the Sunfish’s 2:1. This makes for much more pleasant sailing. The traveler is 3/16 line rigged between the 3/16 X 3 inch screw eyes (short 1 ¼ inch ones came loose) that hold the rear lunch compartment lid shut. We also tried a 1/4 inch screw eye at the middle of the stern, this worked but the carabiner liked to wrap around the screw eye and undo itself. The traveler arrangement seems to sail better. We hoist the sail all the way up so we can sit up in comfort and see under the boom. No window is needed in the sail while sailing, but it is convenient to look through while standing up before starting to check to leeward for traffic, boats, baby carriages, etc. is 40-50 years old. We found the Vang to be superfluous. In the iceboat we are sitting in the cockpit rather than hiking out over waves. We can easily reach up and pull down on the sheet under the boom and bend the boom more if we want to. Nor have we indulged in the “Jens” rig of tying the gaff to the mast because the gaff is hauled all the way up the mast and does not flop around on starboard tack which is what the Jens is for. With the Jens the whole rig, sail and spars, must erected at the same time, clumsy. One of the plusses of Cheapskate is that it is so easy to set up, just pull up the sail and gaff with the halyard. Since we are not (yet) racing other Cheapskates why bother with this go fast stuff, that’s what happened to the DN over the years. Besides, Cheapskate already goes thrillingly fast at times. Sometimes on a reach we pass other iceboats whose skippers are not paying attention. Our initial “tuning” of the rig is to attach the halyard 72 inches from the gaff peak and the gooseneck 21 inches from the tack end of the boom. This is where they were when the rig came off the Sunfish. The halyard needs to be “non stretch” Dacron or it will stretch inches while you sail, very annoying. Skipper comfort is a high priority in Cheapskate, no lying down with the boom on your aching neck as in a race tuned DN or Sunfish. The sail shape looks pretty good from astern in the photo below and she is fun to sail so we haven’t tinkered with the sail arrangement. Perhaps if the gaff was arranged more vertically, pointing might improve but the boom would be down forward, which is right where we want to see. Visibility is a high priority too. The Sunfish Racing book suggests replacing the last couple of shower curtain rings at the outer ends of the gaff and boom with 1/8 cord ties to improve sail set. This works and the sail looks better so does lashing the tack grommet around the small screw eyes that connect the boom and gaff together. That takes care of go-fast mods we found worthwhile. 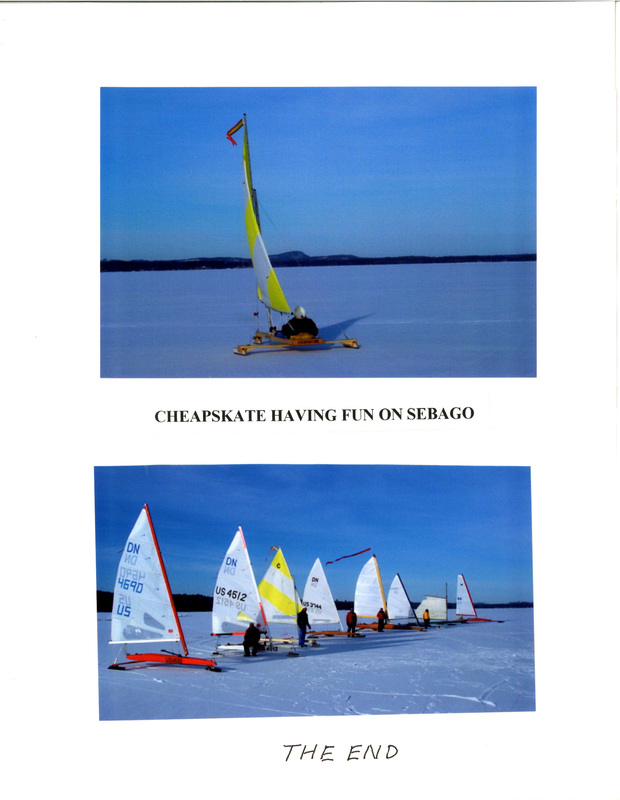 Sailing Cheapskate is a little different from DN’s and other ice boats in my experience. It has no vices, it doesn’t even hike unless really forced to. We did have a hike report from a lady sunfish sailor of perhaps 120 Lbs. She simply eased the sheet and down it came. She was amused because when she felt a puff she thought she should hike herself out but the boat just accelerated instead of tipping. It is easy to sail. It seems to have neutral steering. The sail is not very fussy about trim, a little luffing, or a lot in heavy air, is easy to carry and adjust for, and if you look back you will see the belly of the sail aft of the luff pulling you along. With no multiple sheet blocks there is limited sheet travel, no coils of sheet in the lap or yards of sheet dragging out behind like sloppy DN sailors.  The large sail area compared to DNs (75 Sq. Ft. vs. 60) makes for easy starts, no sprinting required. Down- wind starts, the nemesis of ice boaters, are often successful. In moderate air you can just sort of drive it around wherever you want without paying a whole lot of attention. In light and failing air it gets you home when others are walking. It does not point as well as the Marconi rigged boats, more like a gaff-rigged boat. It is happiest reaching with or without luffing. The lateen rig with its equilateral triangle sail must be responsible for the above. I have a “How to Race your Sunfish” book from the 1980’s which does not address the apparent magic of the lateen sail. The expert author of the book (National and World Champion) dodges the issue saying “you can not compare the Marconi rig of say a Laser with the unorthodox rig of the Sunfish”. Disappointing, I was looking for more insight than “unorthodox.” Henry Bossett, veteran iceboat racer and sail maker, talks about low aspect ratio of the lateen and the open leech spilling air. I think maybe it is the poor man’s answer to the DN’s bendy “rubber” mast. Many people have now tried Cheapskate. They all come back smiling and some want to build one. Welcome to the fleet.